On February 5th, 2015 Bloomberg Businessweek announced that Twitter and Google struck a deal that would allow Google to crawl and index tweets in “real time search”. This is not the first time the two companies have combined their efforts. 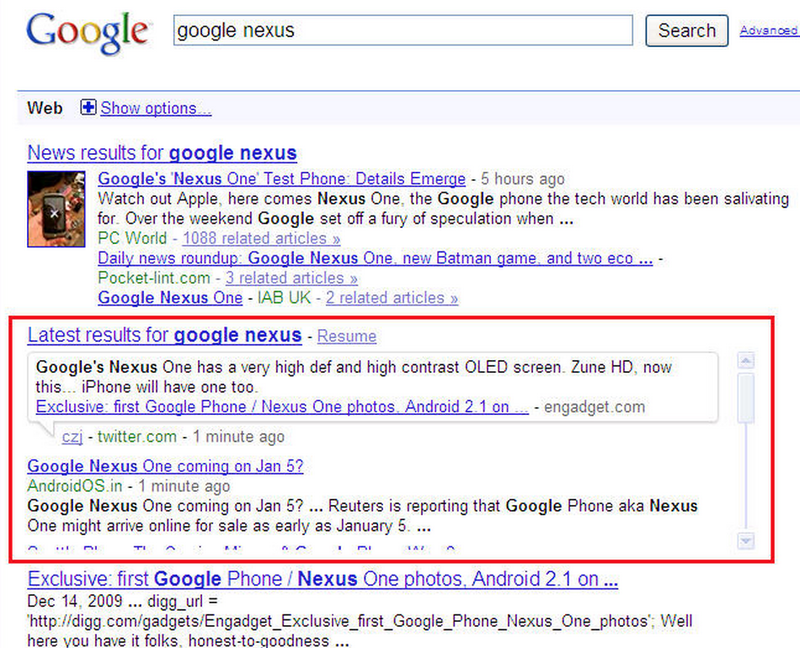 From February 24th, 2010 until July 2nd, 2011 Google offered “real time” search results for trending topics. These real time results did not show up for every search query, only queries that were popular or trending. For well over a year I have predicted that Google would have to adjust their search algorithms to cater to real time events. Sports, award shows and hot topic news cannot get indexed and ranked fast enough. Searches do not want to see a halftime score of a football game that is already over. The only way to provide these up to the second search results is to partner with a company that is getting real time data quickly. Who better than Twitter? On July 2nd, 2011 the Twitter-Google partnership ended and Google no longer had access to the “firehose” of data that was streaming through Twitter. In November of 2014 Twitter announced their native search feature was improved drastically. When searching on Twitter users now have more options to surf through all tweets, not just popular or trending tweets. This means you can search any tweet dating back to 2006. Although Twitter has improved their search it is still the case that Internet users think of Google when it comes to searching. Ask any millennial in the United States and they will say Google is the only place they search. Twitter quickly realized their search could be improved even more by having tweets show up in Google search. In the last three months there have been a plethora of posts with titles such as “Why Twitter is Getting Into SEO”. Well, anyone that has had a website that ranks well in Google search knows the long lasting value of SEO. Instead of getting Facebook or Twitter traffic for a few hours, or even a few minutes, you can get traffic for many years if you happen to rank on the front page of Google search. Trust me, I have lived it for over seven years and search traffic is much more valuable than social media traffic. People are actively looking for something when they search so they get to your website with an intent to buy. This is not the case with social media traffic. This is a very good question. Some SEO minds have debated whether or not a link that is tweeted has any value. With all the spam and craziness on Twitter I cannot see Google assigning a value to most individual tweets. That said, I can see them assigning a value to a tweet that has gained traction and proves to be important. If Hillary Clinton announces she is not running for president in 2016 through a tweet how can that not be valuable? Remember that a Twitter tweet has its own individual URL. As you can see on this Taylor Swift tweet, there is an almost endless amount of responses. That means every single response is part of the content for this individual URL. We know that length of content often matters when it comes to search rankings. If Taylor Swift gets 15,000 140 character responses that is a tremendous amount of content that is on one URL. This is a direct link back to the individual tweet. Not only does Taylor have some amazing responses with content value she is getting links pointing back to her tweet through embed and natural anchor text links. So, what does all of this mean? It means that if you are a celebrity or have a huge presence on Twitter you are going to start seeing your tweets show up in search much more. You may also find that companies and businesses reach out to you for advertising opportunities. If Taylor Swift says she is buying a brand new Audi A4 and posts a link to the Audi page that will likely have much more SEO value moving forward than it did in the past. How Does This Help Google? Think of it this way, this relationship is like WalMart and Proctor and Gamble. WalMart benefits by having Proctor and Gamble products in all its stores because people want toothpaste, paper towels and toilet paper. Proctor and Gamble benefits because they can sell more product with so many people shopping at WalMart. In this example, Google is WalMart and Twitter is Proctor and Gamble. Billions of people search on Google every single week. Google wants to improve their search with real time results. Over the past 15 years Google has always send the end user is what matters. If the end user wants real time results why not give them real time results? In essence, both companies win when it comes to real time search. Twitter will gain a tremendous amount of exposure, especially during live events. Google will provide sports scores, award show updates and real time news events. No longer will it be the case that fans have to go to ESPN and Yahoo! to get scores. They will not have to go to CNN or Fox News to get presidential debate updates. They will be able to get it through real time search results on the front page of Google. How Much Will Twitter Make? Twitter made $41 million in the third quarter for data-licensing revenue. This number is likely to double or triple with the Google deal. Google has $70 billion cash on hand so I would be shocked if they did not pay Twitter well over $200 million for access to their data. Do not quote me on that, but it is well worth it from the standpoint of making search better. If you have crunched the numbers or have any information as to how much Twitter will make on this deal please feel free to comment below. Originally, Google wanted to replace Twitter real time search results with Google+ real time search results. Unfortunately, Google+ never caught on when it came to sports and real time events. In fact, almost no one updates Google+ during live events. The more Google pulls the plug with Google+ the more it will be the case they partner with Twitter and other social networks. I look for Google and Twitter to continue their relationship and Google has moved many employees off the Google+ team. Heck, even with over 800,000 followers I cannot get any engagement or interaction on Google+. Stamey’s BBQ Greensboro, NC Reviews | Why Should I Publish Daily Content to My Business Website? Excellent thoughts. Best article on the possibilities of Twitter & Google integration yet.